Eating healthy can be super challenging depending on the strength of your will power and the size of your sweet tooth. Preparing your meals the night before can really help you stay on track. It’s much easier to choose an apple over chips if they’re already sliced and ready to eat. If your meal is already prepared, you will feel an obligation to eat what is made, rather than reaching for the unhealthy alternative. It is important to have multiple sizes and shapes of containers for different kinds of meals or snacks. We suggest buying a set though, to keep things looking uniformed. Although plastic containers are great because they’re light weight and won’t shatter in your lunch bag, but you should note that it’s better to heat up food in glass containers. Pick a day during the week and set aside time to grocery shop and prepare your food. You can go to the store, buy your food, then prepare it as you put it away. Now your snacks and meals are ready for the week! Although some fruits, like apples and pears, are great foods to slice and prepare for the next day, they brown quickly. If you want to make your fruits last longer in the fridge, soak the slices in cold water with a little bit of salt for 5 minutes. You want enough salt to have an effect on the fruit, but not enough to alter the flavour. This will help your sliced fruit stay fresh for a couple extra days. The whole purpose of meal prep is to save you time and help you stick to a healthier diet. Have some eggs boiling, while your kale is baking in the oven, and you’re chopping veggies on the side. Sounds easy enough, right? Preparing and eating the same meals week after week will get exhausting and boring, which will ultimately drive you away from meal prep. Try out new and exciting recipes each week. 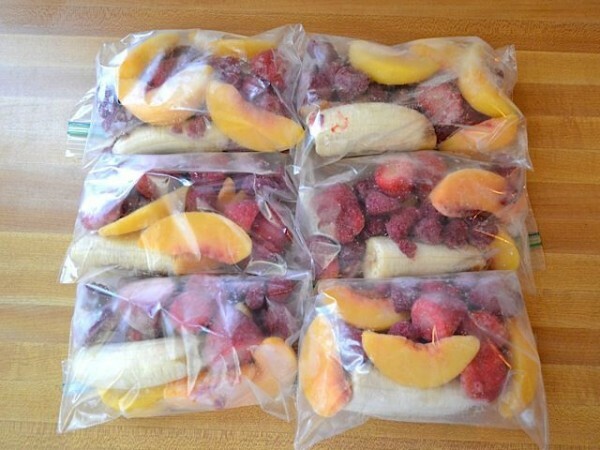 Cut up some fruit and seal it in plastic bags to be stored in your freezer. All you have to do is pour your fruit mix into the blender, add some milk, and then you have a smoothie! 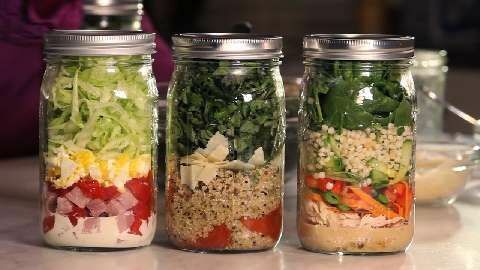 Put your favourite salad mix into a mason jar for storage. When you want to eat your salad all you have to do is pour it into a bowl and add some dressing. 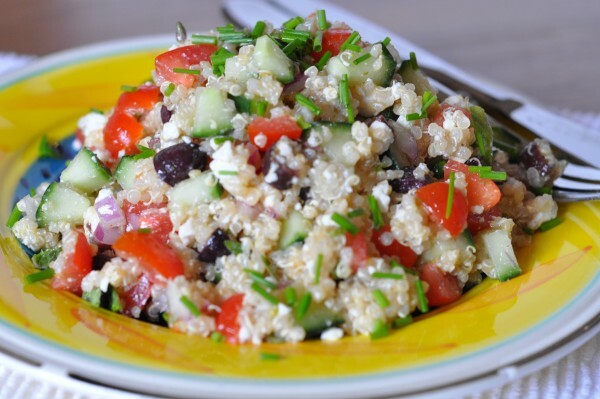 Mix quinoa with tomatoes, peppers, cucumbers, feta cheese and some dressing for a great go to meal.